In many ways, The Blue Chair Jam Cookbook couldn’t be more perfectly timed. Among foodies, at least, we’re at a fever pitch in this country for artisanal, seasonal, small-batch, local-ingredient foods. Throw in some esoteric (at least to many people outside of California) produce and many (too many) self-consciously gorgeous, retro-look photos, and the book captures the moment exquisitely. Cooks who browse bookstores for jam and preserves guides have a choice to make: Are they happy to mix up a batch with a pouch of pectin and easily accessible fruit, or do they want to go all-natural and somewhat exotic? Using commercial pectin (as opposed to producing your own batch of apple pectin, which knocks you into the artisanal category) guarantees that your jam will set, and, generally, the fruit needs a shorter cooking time and often less sugar. Blue Ribbon Preserves, by Linda Amendt, relies on packaged pectin and provides many reliable, low-stress recipes for jams, preserves, and conserves. 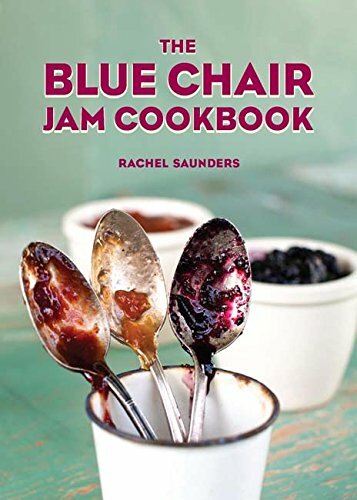 If, instead, a cook wants jam that is pure fruit, sugar, and seasonings, The Blue Chair Jam Cookbook, by Rachel Saunders, owner of The Blue Chair Fruit Company, offers a good variety of recipes and guidance. A few caveats, though: This may be a frustrating book for readers who lack great access to very specific, very fabulous, farm-fresh fruits. Crabapples, elderberries, quince, mulberries, currants—all show up in recipes for which there is no substitute suggested. A recipe for peach jam requires branches of peach leaves, described as essential to the recipe. Another calls for pluots and strawberries mixed together; in many areas of the country, these may be hard to find at peak flavor at the same time. Given that the manufacturer of Ball jars doesn’t suggest oven canning, presumably you’d want to use a boiling-water bath to can these, if you “process according to the manufacturer’s instructions.” Unfortunately, a cook will have no clue from these recipes how long to do so. In the end, readers with any background in making jams will wish Saunders had addressed the obvious question: Why does she consider oven canning to be fine? With no answer to that, for this review, recipes were tested using jars that were boiled for 10 minutes to sterilize them, drained, and filled with hot jam. Some of the jars were returned to the canner and water-processed for 5 to 10 minutes in the standard canning method; others were simply refrigerated. Why take the chance of mold or other spoilage after going to all the work these recipes require? And work you will, making these recipes, many of which require preparation spread over several days. But making jams and marmalades shouldn’t tax a cook too much. The clear instructions found in the recipes keep this process pleasant. For example, each provides the full details for how to check when a jam is done, perfect when cooks want to move quickly at this point, rather than being referred to another page in the book. Even jam-makers without much experience should have little trouble as long as they carefully follow the instructions. Some previous experience definitely helps, however, such as knowing when to turn the stove down to avoid scorching a marmalade, or when to begin testing a jam to see if it will set. Note that these recipes require use of a scale. While that may seem annoying, it should come as great comfort to those accustomed to recipes that call for “4 cups crushed berries” or “6 cups chopped peaches.” Who knows if you crushed or chopped to the same size as the recipe’s author? Working with weight, for fruit and sugar, gives cooks confidence. Many of the offerings here provide interesting flavors that go beyond basic jam and marmalade recipes. One recipe, for a marmalade of pears and lemons, lived up to its description as “lovely,” with a whiff of cinnamon, cloves, and cardamom. Pear jam with rosemary (minus the pinecone bud syrup called for in the ingredients), blueberry jam with mint, and blackberry jam with lemon basil also make distinctive preserves. With recipes arranged by month, The Blue Chair Jam Cookbook makes it easy to find, say, all the fig possibilities in one spot. If you have good figs, kumquats, rhubarb, and berries, and need more ideas to use them up, this book provides solid inspiration.